Republican Senator John McCain is perhaps the best known person who has brain cancer. His is a glioblastoma, the most deadly type. Since McCain announced the news last year, he has had surgery and chemotherapy. There’s no cure for this type of cancer, and even with treatment, most people don’t live longer than three years after being diagnosed. Surgeons often can’t remove the entire tumor because it might affect brain functions, or it might be attached to the spinal column. These tumors often grow tentacles that make them impossible to cut out completely. Untreated, people have just months to live. But even with treatment, the two-year survival rate is just 30 percent, according to the American Brain Tumor Association. What’s hopeful is that some new treatments are showing promise. A case in point is Lori Mines. This 40-year-old wife and mother was diagnosed with stage four brain cancer two years ago. She had a severe headache followed by a stroke. When doctors ordered a brain scan, they found two large brain tumors, one on either side of her brain. One of the tumors was attached to the spinal column so it couldn’t be completely removed. After surgery, Mines had radiation. “I didn’t even want to know anything about it. I just basically wanted to focus on trying to get better,” she said. Even noncancerous brain tumors can be deadly if they interfere with portions of the brain responsible for vital bodily functions. Treatment often includes surgery, chemotherapy or radiation or a combination of these treatments. 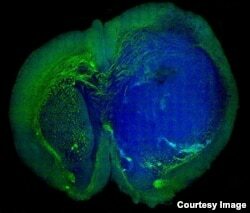 This image of a human glioblastoma brain tumor in the brain of a mouse was made with stimulated Raman scattering, or SRS, microscopy. The technique allows the tumor (blue) to be easily distinguished from normal tissue (green). Glioblastomas are the most common type of cancerous brain tumors, and the five-year relative survival rate is less than 6 percent. Mines says she’s realistic, although she hopes she can live longer. She says she will just keep fighting for herself, for her husband, and for her young daughter. “I have persisted because there’s no other option,” she said. Scientists at Duke Health found they can increase the survival rate for some patients by injecting a modified polio virus directly into the tumor. Other researchers are trying to get the body’s immune system to attack the tumors. Dr. Arnab Chakravarti heads the Department of Radiation Oncology at The Ohio State University where he specializes in brain cancers. Chakravarti says medical researchers are examining novel clinical trials, targeted therapies and immunotherapies. “There’s a lot of hope for this patient population,” he said. Chakravarti led a study on the genetic makeup of gliomas, brain tumors that can be cancerous or benign. The researchers found they could more than double the life expectancy among patients who had a distinctive biomarker, a cell or a molecule that is present with a particular type of tumor. It helps doctors decide what treatment can work best to shrink the tumor. “It’s very important to personalize care for the individual patient and that’s why biomarkers, prognostic and predictive biomarkers are so important,” Chakravarti said. The study was published in JAMA Oncology. Experts say testing genetic markers will become the standard for patients with malignant brain tumors. They are also looking at targeted drug therapies as part of individualized treatment. The hope is that getting a diagnosis of brain cancer will no longer be an imminent death sentence.